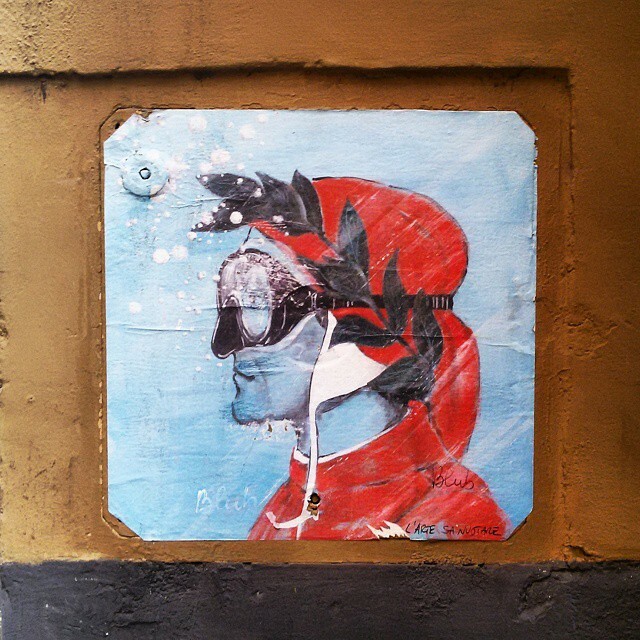 There is a new sensation in town and the street art in Florence is flourishing. 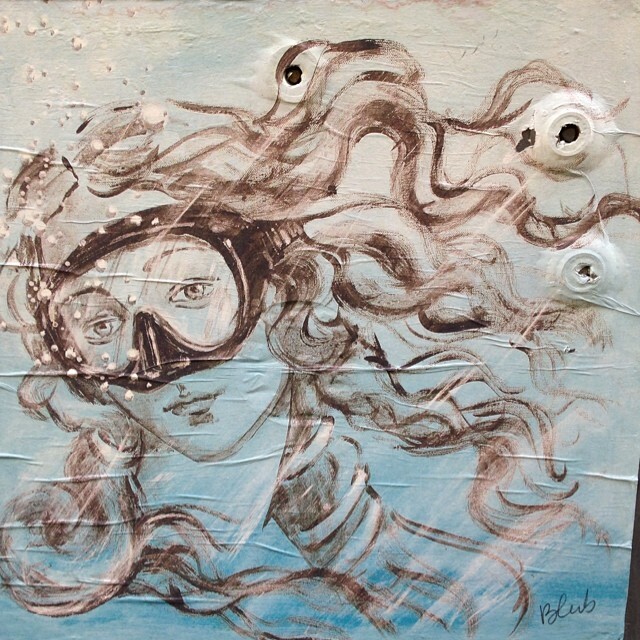 Italian icons like Dante and Botticelli’s Venus—even Amy Winehouse portraits—are filling our alleys wearing scuba masks as they calmly swim deep down underwater. Who is this artist people ask and what does it mean? I’m here to share some secrets because first of all this artist likes to remain anonymous. One can never be too sure what gender Blub is, how tall Blub is or what Blub even sounds like. The cool thing about this is that I may have had an aperitivo next to Blub and not even known it. 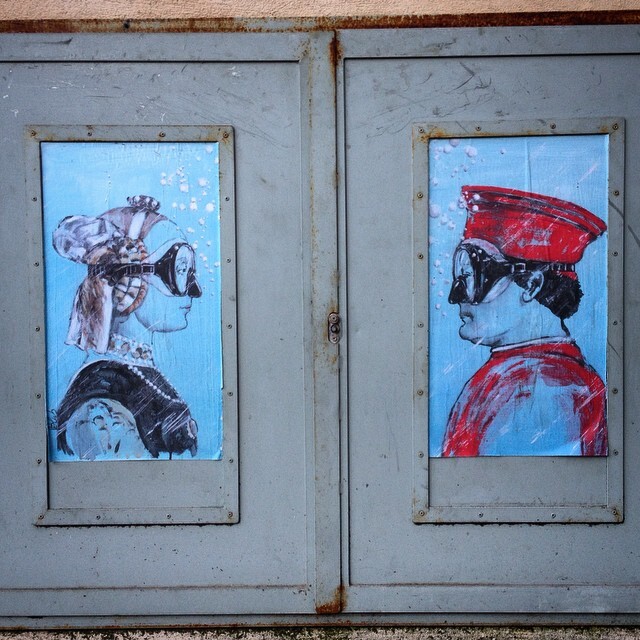 So, let’s get on with the interview about one of my favorite street artists in Florence! *Don’t miss a sit-down interview with Clet! Even though readers would love to know who you are, I must respect your wish to remain anonymous within the streets of Italy and on the web. 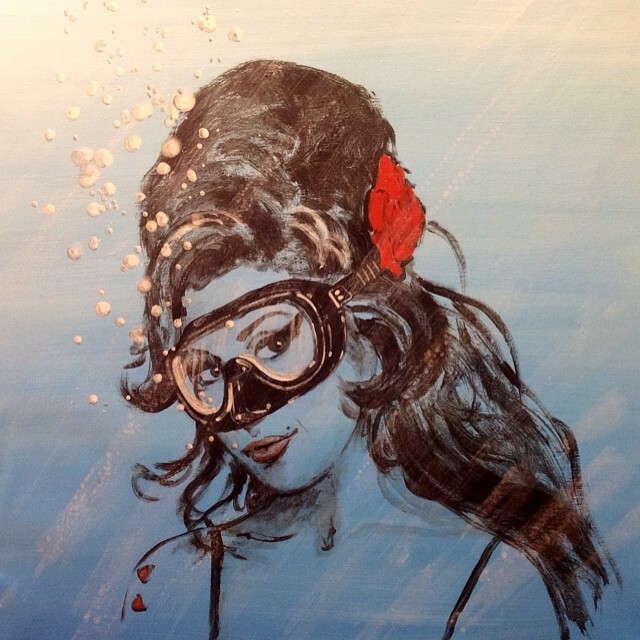 Many people may guess what your work, L’arte sa nuotare, means and to me I feel like it can be a simple sense of joy, of transforming the past into a whimsical and playful filter of bubbles into the deep blue sea. However, I get the sense that there is a deeper side, perhaps one relating to how things—as in the economy—are under water? 1. What does your “L’arte sa nuotare” work really reflect? I like for people to have their own interpretation of what the scuba masks on these icons mean. For me, I had a vision. Before I paint I normally rely on these visions that appear in my mind. I perform instinctively, which creates the best art. Then maybe I think about the piece and things can further materialize from there. 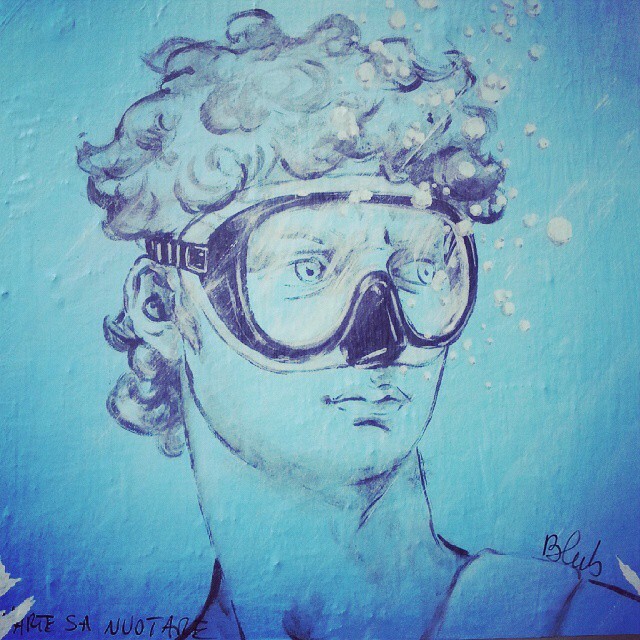 L’arte sa nuotare, meaning art knows how to swim, is about two ways one can live life, like eros and love or life and death. We can choose to be stuck with fear due to the crisis or we can choose to take it as an opportunity to overcome our limitations while being confidence in the future and in our potential. So, even though it seems like we are all underwater it is time to learn how to swim! Renaissance art in Florence is still strong and hides today’s art that is alive and contemporary, so by using icons of the past with diving masks the theme presents a mix between the past and the contemporary world. There is no need to deny the past in order to look at the present, but at least acknowledge it. 2. What makes you happy about the art you create? What makes me happiest is when I see thank you notes from shop owners after I stick prints up in front of their shops or doorways. I also love when I overhear people say “Blub makes people smile”. Sometimes I see tape on my art from people trying to preserve it or fix it if it was torn, it is nice to see strangers trying to ensure the work remains intact. 3. When and where was the first street art you completed? In Spain a year ago. 4. Can you share a little about your past? I have read that you are from Florence, do you still live within the beautiful Florentine streets? All I can say about my past is that I am from Florence. I still live in Florence, but I travel quite often. 5. I’m sure you can’t give too much about your past away to the readers, you never know who’s reading this! 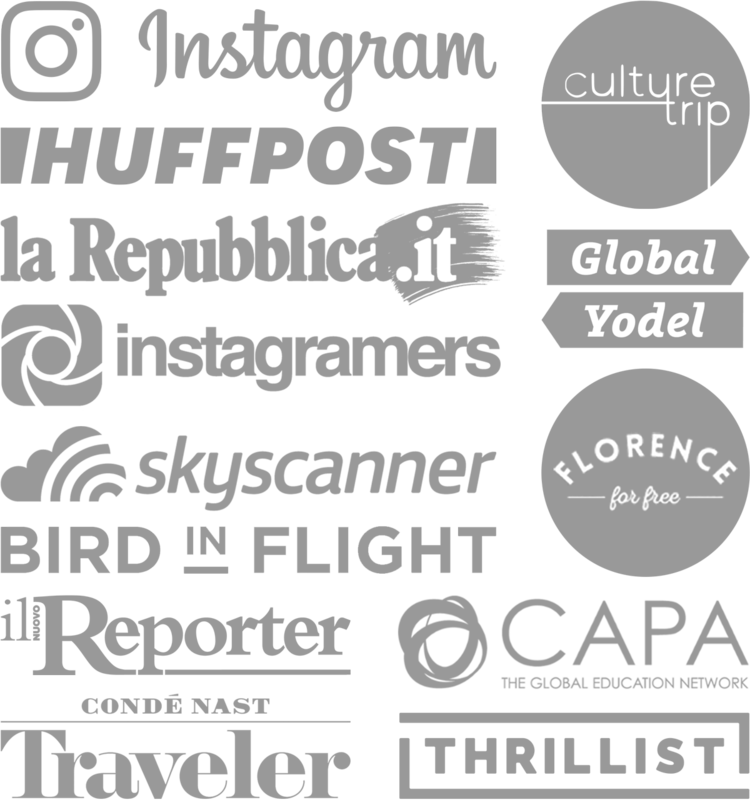 What are three places in Florence that you think everyone should visit? Only three places? I like San Niccolò and the streets that lead up to Piazzale Michelangelo. Downtown Florence and the hills surrounding it are rare sights, but I also like San Frediano and Santo Spirito. 6. I see you have work displayed at Cappelleschi Gallery in Belgium with some other favorite street artists: Clet, Exit/Enter and UrbanSolid. Do you sell your work directly to fans or would I have to purchase a piece from the gallery? I am displaying my art at Cappelleschi Gallery in Belgium, which is carrying original pieces so in Florence I can sell prints like the ones you see on the streets. You can buy my prints at Via San Niccolò, 44/r. 7. Do your friends know what you do or do you try to limit the amount of people who know your true identity? Has it been easy? Only a few friends know it’s me. For now it has been easy to remain anonymous. I prefer to remain anonymous; I feel more at ease and my instincts tell me to keep my identity anonymous for now. 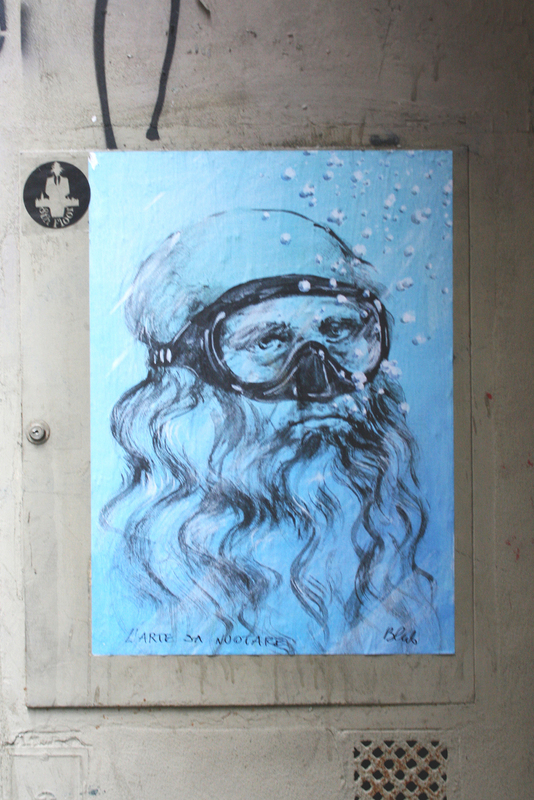 You want to stick art up around the city with me? If and when I am no longer anonymous I will call you! Have you seen Blub’s work before? Follow Blub on Instagram and Facebook. 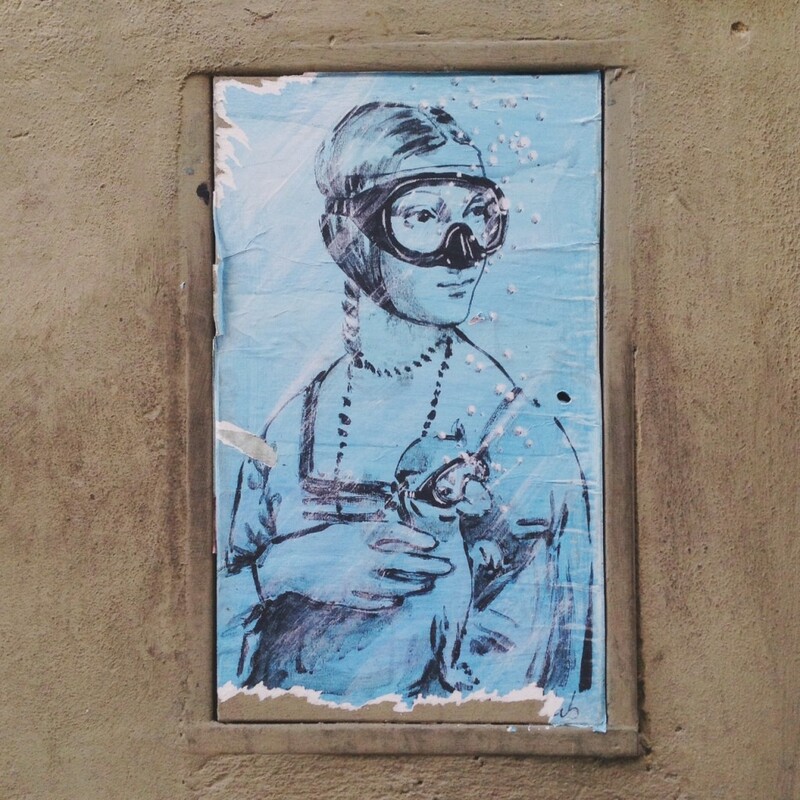 I hope you learned more about the street art in Florence, so please share this post and pin those pics! Cool Nathalie, I read that Blub was in Rome this Spring. I want a print for my house! One of my favorite posts from you! I’ve always wondered the story and background of these amazing pictures wandering the streets of Florence! Fingers crossed that one night you get to be a secret agent assistant masterpiece hanger! I haven’t seen them myself but what interesting art and story! Great post! They are so much fun Becky, Blub is branching out so be on the look out! Thanks, nice seeing you here! Wow, we peeled one off of a wall in Florence 3 years ago and it is hanging in our home, framed for eternity.